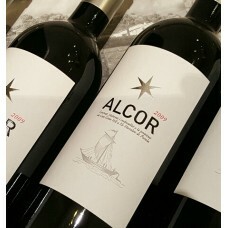 This vintage of our favourite Spanish red is another stunning success. 93 point rated by PEÑÍN yet again, this vintage is more Syrah dominated than the 2011. A powerful nose; smooth and rich in the mouth, with well-integrated tannins, combined with fabulous balance. This wine will grace any dinner and with just 5,000 bottle production and being their only Swiss importer, you are getting something truly unique! Dense ruby colour, with a powerful nose of blackcurrants and black cherries, tobacco, liquorice, earthy vegetal undertones and cedarbox. The palate has lots of volume and is very well integrated with plenty of macerated dark fruits, brambles, hints of dark chocolate. A perception of being slightly darker, with heavier tannins than the previous year, probably due to the higher % of Syrah. This wine is already drinking very well, however previous vintages are showing how well this wine will develop too, with at least a decade of pleasure ahead. This young, small winery was started by Jordi Castellvi in 2002 near Hostalets de Pierola, on the west side of the stunning Montserrat mountains, in collaboration with the Pérez Ovejero family (Mas Martinet - Priorat). The lovely estate, surrounded by forest, is situated 350-450m above the sea level with a mixture of soil types. Just three hectares of vines (Syrah, Grenache, Cabernet Sauvignon, Monastrell and Marselan) were planted in April 2002 surrounding the winery on a “no expenses spared” basis. Its small size allows for very high attention to detail and manual intervention. 2009 is the 6th vintage, is one of the top wines of Catalunya, with all the previous vintages receiving very high ratings as well (93 points from Peñín). Jordi lives at the winery and also runs his own restaurant in Barcelona. This is clearly his lifetime passion and it shows. The terroir is exceptional to generate such high quality from such young vines. Alcor’s of the future will clearly just get better and better.